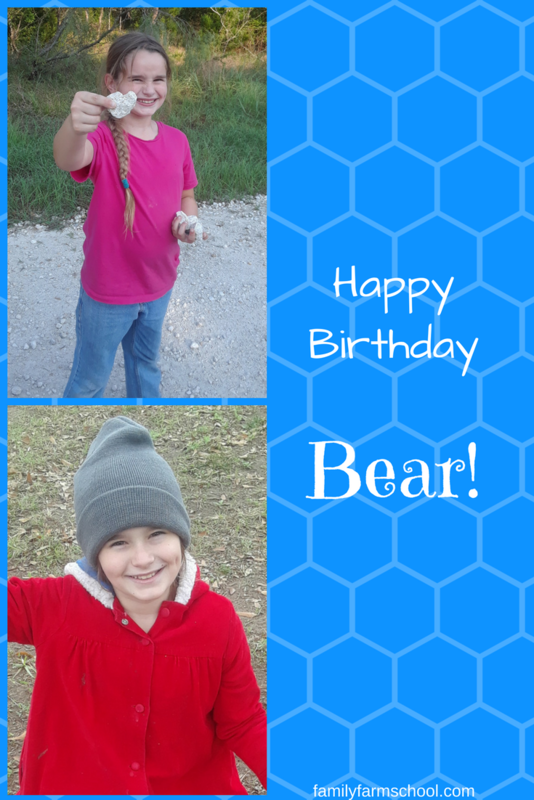 Happy Birthday, my dearest Bear. The past nine years have flown by! You were such a tiny thing when we brought you home. Five pounds, 15 ounces…you didn’t even break 6 pounds. But look at you today! You’ve grown into such a strong, healthy, wonderful girl. Eventually, you did stop crying. We started sleeping again. And I started to get more confident that you weren’t, in fact, going to die at any moment. You have born my blunders beautifully, and thrived in spite of them. These days, when you’re not busy with your schoolwork, you can often be found cuddled up somewhere reading a book. You mostly taught yourself to read, after we taught you most of the letter sounds. You kind of took off, and taught yourself the rest. I wish I could take credit for it…but I can’t! You enjoy helping your Daddy in the gardens. You’re a country girl at heart, and you don’t mind getting your hands or clothes dirty. You’re help me out around the house and with your brothers and sisters a lot, too. In fact, most days, I don’t know how I’d make it through the day without you here to help! You’re always happiest, though, when I put you on Baby duty for a few minutes while I put in a load of laundry, or go outside to ask Daddy something. You say it makes you feel like a grown-up. You have a great work ethic…when you really set your mind to it. It will serve you well one day, when you figure out how to harness it. Your favorite things to do, however, involve art. You enjoy all kinds of art projects. You spent some time this past Thanksgiving with your great-grandmother, learning about watercolor painting. You are still talking about that trip, and still enjoying practicing the skills she taught you. You can hardly wait until the next time we go to visit to have your next set of lessons. Your great-grandmother is very talented…I hope you heed her teachings, and commit them to memory. You seem to have caught a little horse fever this year as well. We wish we could find some way to get you and your brothers and sisters a horse (or two). But, horses don’t come free, and we have very little expertise in horse care or training. I really need to hurry up and consult my sources (you know who you are). We don’t have the “we live in the city” excuse that G-ma and G-pop always used when I asked for a horse. All I can tell you right now is, “Not yet, my dear. But perhaps soon. Keep that hope alive.” For now, you’ll have to settle for stable models and 1:12 scale horse and rider toys to go inside. If you’re lucky, maybe you’ll also get that stable cleaning play set you want that comes complete with plastic manure! You made your birthday cake almost entirely by yourself this year. You could have done it all by yourself if I had gotten out of your way. But, I like hanging out with you, and at this point, you still like hanging out with me. It was a fun thing for us to do together. But, when it came time to put the frosting on and decorate, I had to get out of the way. You did that part entirely by yourself. I never would have even tried to draw a horse with frosting (I can’t even draw a horse with a pencil!). But you weren’t afraid to try it out. You claimed those horses…everyone else had to eat the sky! I love the talks that we have together. Especially the rare long ones we get uninterrupted. You have such lofty goals and ideas for the world. I’m sure you can be a writer and a publisher and an artist and farmer and a momma. You have the drive to do anything you want! I love you, sweet girl. Happy Birthday!